A 17-year-old aristocrat falls in love with a kind but poor artist aboard the luxurious, ill-fated RMS Titanic. Because this 3D Blu-ray release acts as my fifth review of 1997’s Titanic, I won’t repeat my usual movie comments. If you’d like to read my thoughts about the film, please consult my look at the 2005 DVD version. As a summary, I loved Titanic in 1997 and think it continues to delight in 2019. Yeah, it still suffers from the same flaws that slightly marred it 15 years ago – mainly due to awkward dialogue and stiff characters – but it also remains romantic, dramatic and emotional. The existence of Aliens ensures it’ll never be my favorite James Cameron movie, but I love it nonetheless. Titanic appears in an aspect ratio of 2.35:1 on this Blu-ray Disc. From start to finish, the image looked splendid. No issues with sharpness ever arose. At all times, the movie displayed rock-solid definition; even the unavoidably murky underwater elements came across with nice clarity. The movie was consistently tight and concise. Jaggies and moiré effects were a non-factor, and no issues with digital noise reduction affected the proceedings. Print flaws failed to appear; the transfer never showed any specks, marks or other distractions. With a warm, amber palette, colors were strong. Cameron suffused the film with a lovely glow that showed up nicely on this disc; nighttime “sinking shots” also used a chilly blue well. The picture consistently offered strong, vibrant and accurate hues. Black levels appeared deep and firm, while shadow detail looked very good, an especially important factor since more than half of this film takes place at night. The image gave us the impressive visuals expected of such an “A”-list title. I also felt dazzled by the amazing DTS-HD MA 5.1 soundtrack of Titanic. The audio used all five channels very well and completely involved the listener within this environment. The sound seemed discrete and well-balanced, as it blended together naturally to form a strong three-dimensional soundstage. Most of the information came from the ship-related elements, of course. As the ship soared across the sea in the movie’s first half and then fell to pieces in the second, all the speakers created a life-like and impressive setting that made it feel like we were onboard the vessel. From start to finish, this track sounded topnotch. Dialogue seemed clear and natural even though much of it must have been dubbed, and it always appeared easily intelligible. James Horner's score came across beautifully. The track could deliver it gently or powerfully, depending on the situation. Effects seemed absolutely realistic at all times and were very clean. The depth of the audio also appeared terrific; this mix really pushed the LFE channel hard, but no problems with boominess occurred. No distortion ever interfered with the audio. Put simply, Titanic sounded terrific. 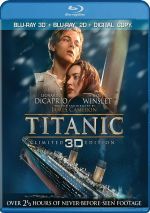 This package includes both the 2D and 3D versions of Titanic. The picture comments above reflect the 2D image – how does the 3D compare? In terms of quality, both seem very similar. While the 3D takes a slight hit in terms of delineation and brightness, those don’t become notable concerns, so the two provide nearly identical visuals. As for stereo imaging, the 3D Titanic largely opts for an impression of depth. Pop-out moments remain rare, so the image ladles out lots of perspective instead. It does well for itself in that regard. The 3D adds a good sense of dimensionality, especially when we get shots over the side of the ship or underwater elements. Titanic doesn’t become a better movie in 3D, but this does offer an interesting alternate way to watch it. By the way, the 3D Titanic comes with a 1.78:1 aspect ratio instead of the 2D’s 2.35:1. Because James Cameron shot the film Super35, this mainly opens up the image and doesn’t require cropping. That said, I’d prefer the original ratio. Cameron chose 2.35:1 for a reason, so I’m not wild about the alteration. The 1.78:1 doesn’t harm the film but I still like the original better. On 2D Disc One, we locate three separate audio commentaries. The first comes from director James Cameron as he presents a running, screen-specific chat. Cameron discusses factual elements of the film and liberties taken, shooting underwater and various forms of effects, casting, characters, and working with the actors, the script and story, stunts, locations and sets, and general notes from the shoot. This was only Cameron’s fourth commentary, but the other three – for Aliens, T2 and Solaris – were all excellent. His Titanic discussion is also quite good, but it’s not in the same class as its predecessors. To be sure, Cameron gives us a very nice view of the flick’s creation, and we receive a good feel for all the measures used and challenges faced. That said, I think things remain a little too technical. At times it feels like he mostly wants to impress us with the film’s authenticity, and the nuts and bolts aspects get a bit tedious. However, whatever disappointment I feel is relative. I admit I expected greatness from this commentary since the other Cameron tracks are so good. While not excellent, this is still a very solid overview of the production and well worth a listen. I’ll probably like it more next time I screen it. For the second track, we hear from cast and crew. This commentary packs in a large number of participants. We get remarks from executive producer Rae Sanchini, producer Jon Landau, deep dive technical coordinator Ralph White, second unit director Steve Quale, first assistant director Josh McLaglen, re-recording mixer Gary Rydstrom, art director Martin Laing, camera operator Jimmy Muro, choreographer/etiquette coach Lynne Hockney, costume designer Deborah Scott, visual effects supervisors Robert Skotak and Rob Legato, composer James Horner, music editor Joe Rand, director of photographer Russell Carpenter, production designer Peter Lamont, unit production manager Kevin de la Noy, sound designer/re-recording mixer Christopher Boyes, stunt coordinator Simon Crane, associate editor Roger Barton, and actors Bill Paxton, Lewis Abernathy, Gloria Stuart, Kate Winslet, Frances Fisher, Danny Nucci, Jonathan Hyde, Jason Barry, Billy Zane, Victor Garber, Bernard Hill, Jenette Goldstein, Ioan Gruffudd, Ewan Stewart, Ellen Mower, Judy Prestininzi, and Suzy Amis. Obviously the size of the roster necessitates edits, as I think only Landau and Sanchini sit together. The track’s producers combine the many elements well, though, and they turn this into a smooth discussion. Lastly, we get a track with historians/consultants Don Lynch and Ken Marschall, both of whom sit together for their running, screen-specific discussion. As one might assume, they mostly get into issues related to the facts behind the movie. They tell us what parts of the movie accurately reflect reality and which take artistic license. They also chat about their experiences during the making of Titanic and give us some notes about the shoot. 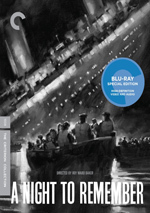 The best parts appear during the movie’s second half, as they delve into the specifics of the sinking. Overall, the discussion helps flesh out some historical issues, but it falls short of becoming truly rich and informative. The guys devote a lot of the track to praise for the film, and that gets old. I think this commentary would have been better if it’d come from people not involved with the production. Lynch and Marschall don’t have any distance from the film, so I don’t know how objectively they view it. This track offers generally good notes, but it suffers from too much happy talk to provide a strong examination of historical issues. With that, we head to the supplements disc, where fans will zoom toward the collection of 30 deleted scenes. Watched together via the “Play All” option, these last a total of 57 minutes, 32 seconds. These come with optional commentary from Cameron. In addition, Cameron offers a voiceover when you enter this screen; he gives us a few notes about what we’ll see. Some of the clips restore historical details such as issues related to the wireless and warnings. We also get a little more information about the actions of real participants. Many of the elements focus on deleted subplots such as Fabrizio’s romance, and some expository bits between Jack and Rose get the boot. There’s also a little more in the present day, especially between Brock and Lizzy; that piece sets up the alternate ending. The single biggest cut comes from the scene in which Cal chases Jack and Rose as the boat sinks; it gets a lot more attention here as Lovejoy continues the chase. This area also includes an alternate ending. The clip differs from the current ending in only one significant way: the manner in which Rose disposes of the necklace. It’s fun to see but was definitely a good omission, as it mars the movie’s emotional arc. Should any of these scenes have made the final cut? That’s tough to say. Much of it definitely deserved to be removed, as a lot of it was unnecessary at best and a distraction at worst. The extended chase I mentioned was a particularly good omission. Some of the smaller moments might have been nice to keep, however, as they add a little life to the smaller roles. I know this is the story of Jack and Rose, but a bit of extra breadth to the secondary parts would have been interesting. Cameron’s commentary proves useful as always. He offers lots of notes about the scenes and their creation. He also usually tells us why he cut the sequences, but he doesn’t always do so. Despite that flaw, this is another informative chat. Production features many materials, and under Behind the Scenes Mode, we find a slew of short clips. These originally appeared as a “branching mode” on the 2005 DVD, but that option doesn’t appear here, so we just get them as a collection of snippets. Taken all together, we get 63 pieces that last a total of one hour, three minutes, 34 seconds. As implied by the title, these focus on behind the scenes materials, and they also feature comments from the participants. We hear from returning speakers Cameron, Landau, Sanchini, Laing, Stuart, Winslet, Abernathy, Legato, Marschall, Lynch, Skotak, Nucci, Quale, Carpenter, Bates, Lamont, Scott, Fisher, Garber, Hockney, Barry, McLaglen, Crane, and Mower. In addition, we get comments from these new folks: motion control operator Jim Rider, model crew chief Gene Rizzardi, art director Bill Rhea, visual effects cameraman Dennis Skotak, assistant costume designer David Le Vey, actor Leonardo DiCaprio, digital artist Judith Crow, visual effects supervisor Richard Hollander, production supervisor Gig Rackauskas, co-producer Sharon Mann, historian George Mehe, and vocalist Celine Dion. In a way, these clips act as a sort of video commentary, for they correspond to the film as it progresses. These nicely complement the other commentaries because they focus more on the technical elements. We don’t learn a ton about effects in those tracks, but we get good coverage of those elements here. We find out a great deal about the challenges related to the recreation of the ship and all attached concerns. These go into various effects as well as stunts, camerawork, props and sets. A few other topics like the characters and actors also pop up, and we learn a little more about the history, the story and the costumes. The elements mentioned dominate, though, and they come to life well via all the behind the scenes footage. We see nice examples of the elements as the snippets demonstrate the subjects. I wouldn’t want to use the branching aspect of this feature, as I think it would distract from the movie too much. However, taken separately, they’re very interesting and informative. We hear from documentary director Ed Marsh during the optional commentary for the Construction Timelapse. As implied by the title, this shows the building of the huge fake Titanic in quick fashion. It’s definitely interesting to view the vessel as it goes up, and Marsh helps let us know about some issues related to it in this four-minute, 20-second piece. James Cameron narrates the 15-minute and 30-second Deep Dive Presentation. This shows footage from the expeditions to film the Titanic wreck. Of course, some of this appears in the movie, but we get a nice collection of raw shots here. Cameron talks about how he convinced the suits at Fox to support this shoot and also lets us know what we see in his useful commentary. Next we get something called the $200,000,001: A Ship’s Odyssey (The Titanic Crew Video). This 17-minute, 52-second clip offers a few bloopers, but it’s not a classic gag reel of that sort. Instead, the comedic collection shows goofy moments from the set – both intentional and unintentional - and interjects some irreverent moments. It ends with a long look at the folks who worked on the film. It’s surprisingly entertaining. Two Videomatics last a total of three minutes and 18 seconds including an introduction. These provide a crude form of previsualization in which Cameron combined rough shots of miniatures and storyboards to get a feel for how to shoot the sequences. They provide an interesting look at this element, though I’d have liked to see more of them. The four Visual Effects clips fill a total of seven minutes, 50 seconds. These allow us to see how various elements were combined to create the shots seen in the final film. They work well as they demonstrate various techniques. The package includes two circa 2012 documentaries. 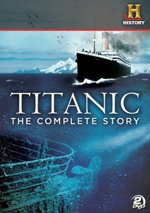 Reflections on Titanic goes for one hour, three minutes, 47 seconds and offers notes from Cameron, Landau, Winslet, Bates, Lynch, Amis, Paxton, Zane, Marschall, Gruffudd, Garber, Hill, Sanchini, Nucci, Horner, Dion, film critic Joseph McBride, author David Lubin, Titanic forensic analyst Parks Stephenson, Lightstorm VP Production Services and Technology Geoff Burdick, News Corporation President/COO (1997-2009) Peter Chernin, AFI president/CEO Bob Gazzale, AMPAS president (2009-2012) Tom Sherak, and Stereo D president William Sherak. The show looks at the film’s origins and development, cast, characters and performances, research/realism, sets, production pressures and bad press, editing and the film’s release, the movie’s success, backlash and afterlife, and its 3D re-release. Expect nearly wall-to-wall fluff from this disappointing program. I hoped it’d give us good memories and stories, and a few of those materialize. Unfortunately, the majority of the show does little more than tell us how amazing and successful the film was. It’s a painless experience, but it’s not particularly insightful. Titanic: The Final Word with James Cameron runs one hour, 36 minutes, 16 seconds. Here we get notes from Cameron, Marschall, Stephenson, Lynch, RMS Titanic Inc. Director of Underwater Operations PH Nargolet, RMS Titanic Inc. Director of Research Bill Sauder, Woods Hole Oceanographic Institute Director of Special Projects David Gallo, US Naval Academy Naval Architect Commander Jeffrey Stettler, and US Coast Guard Navala Architect and Salvage Engineer Brian Thomas. 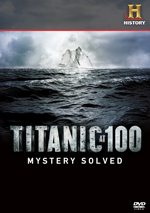 They discuss aspects of the Titanic’s sinking, with an emphasis on information learned since the film’s creation. This means we find out what the movie got wrong, and those offer the most interesting moments. Much of the program can be a bit dry – at least for me, as I’m simply not that interested in the minutiae involved in the ship’s sinking. If that area interests you, though, you’ll get some good details from “Final Word” – even if the title seems too ambitious, as I don’t think there’ll ever by a “final word” about the disaster. Archives creates the final domain, and we find the music video for Celine Dion’s “My Heart Will Go On”. I can’t stand Celine, but I must admit I maintain a soft spot for the song, mostly because I associate it with my fondness for the movie. Unfortunately, it’s a dull video, as it uses the standard lip-synch/movie clip format. Yeah, it puts Celine on a ship setting, but it brings nothing creative to the genre. Within Trailers, we find many ads. We see concept art for an unused teaser – complete with the movie’s original July 1997 release date attached – along with two US 1997 trailers, a 1997 international trailer, and both 2D and 3D versions of the 2012 promo. The set throws in seven TV spots as well. If you have hours to spare, head to the Still Galleries, where we find a wealth of material. We get Cameron’s original “scriptment”. This lets us get a look at an early version of the film, though it’s certainly not a sketchy look; it fills 482 screens with text! I really like that we can check out this piece and see other ideas Cameron had for the film. Nine Storyboard Sequences go through different scenes. We get “MIR Sequence” (61 stills), “Southampton Departure” (27) “Ode to Titanic” (46), “Pre-Collision Scenes” (51), “Iceberg Collision” (58) “Loading Lifeboats/Panic” (91), “Final Sinking Sequence” (135) and “Aftermath and Rescue” (43) and “Final Shot” (20). That’s quite a collection of drawings, and most are very attractive; these aren’t crude little sketches. This is a great look at the planning that went into the movie. “Production Artwork” breaks into three smaller areas. We get “Production Painting by Tom Lay” (71 frames), “Costume Design Art by David Le Vey” (68) and “Wreck Sketches by James Cameron” (9). All are good, but I especially like Lay’s art. The presentation works well, as it starts with a wide shot of the elements and then usually lets us see the pieces in more detail. When we look at “Photographs”, we again split into subdomains. This area presents “Deep Dive” (45), “Escondido” (17), “Halifax” (29), “Rosarito” (377), “Model Shop” (161), “Russell Carpenter’s Polaroid Trail” (447), and “Core Extras’ Scrapbook” (214). There’s literally hours of shots to examine here, and much of it’s quite good. We find a nice examination of the different parts of the shoot in this quality collection. More art shows up in “Ken Marschall’s Painting Gallery”, and we get 82 frames of his work here. As with prior art galleries, these break down the paintings into segments after we see the whole piece. I like that method since it better allows us to view all the detail, and this becomes another terrific set of stills. The galleries finish with “Concept Posters and One Sheets”. This provides ads for the 1997 and 2012 releases of the film; 66 screens show these images. I especially like the abandoned concepts. This disc finishes with three Titanic Parodies. From there you’ll watch a four-minute and 37-second clip first aired on the 1998 MTV Movie Awards. It shows Vince Vaughn and Ben Stiller as agents who try to convince Cameron to make a Titanic sequel, and it’s pretty amusing. Next we get a four-minute, 50-second clip from an episode of Saturday Night Live hosted by Bill Paxton. It parodies the film and uses Cheri Oteri as old Rose. It also ends with a funny coda from Cameron. For the final parody, we find “Titanic in 30 Seconds”. Despite its title, the animated piece runs 51 seconds, and shows a radically abbreviated version of the film – with cartoon bunnies. It’s silly but fun. Does the Blu-ray drop any extras from the 2005 DVD? Yup – it loses a 1998 promotional TV show, some “Press Kit Featurettes”, and a “1912 Newsreel” actually created on the Titanic set. These aren’t major omissions, but I’m surprised they didn’t reappear here. Moving, entertaining and often stunning, Titanic remains an exceptional film. The Blu-ray delivers immaculate visuals, immersive audio and a wide, informative set of supplements. This becomes the definitive release of the film, and the 3D version adds an interesting viewing option.